Cycling in a foreign country makes me aware of the differences in culture, politics and economics in the world. As a matter of fact, it is the only reason why I have always wanted to travel. Rather than base my opinions on the media in my own country I have always felt the need to go and see myself. This made me travel into the communist European countries – behind the iron curtain, which was not easy – in the seventies (seems ages ago now) and to so many other parts of the world. I wanted to see and experience how culture and systems (governments) shape societies and determine the lives of their citizens. So I did in Cuba. 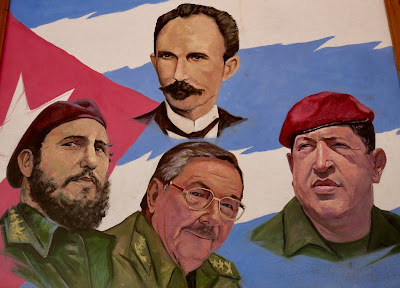 To tell the truth, I loathed the Cuban goverment many times for the results of their policies for the Cubans. Many times I felt pity for the Cubans, for their poverty, for the empty shops, for their waiting, endless waiting. My mistake is that I compare it to the Netherlands. I know that my country is one the most organised, reliable, free and prosperous countries in the world. So this comparison is unfair. What I ought to do is compare Cuba with the countries in the region. And then the result is opposite. Haïti, the closest neighbour, is the poorest country in the world. Then there are Nicaragua, Honduras, Mexico, Venezuela, Brasil (a Brasilian couple made this clear to us), countries where there are many homeless people, where crime and corruption are horrandous. The Cubans are a merry and friendly people, all of them have access to education and health care, they are well fed and the middle class is growing. In this comparison Cuba earns the best marks, thumbs up and great compliments, despite the fact that it is no democracy and that the US-bloccade has still not entirely been lifted. The (too many :-)) photos are now to be seen. Click on the link in the right column.